Situated in the south, only 15 minutes drive to the coast (Maspalomas). You will enjoy lazy days on the outside terrace with bbq, you can pick the fresh fruits out of the garden!. 4 of the 5 bedrooms have airconditioning. Excellent place!!! We where travelling with 16 persons and we all fit fine in the house. Garden was very beautiful and fresh fruit from our own garden,wow! There was all kind of games (pingpong table, mölkky and darts) . This property was perfect for us, plenty of room for everyone to have their own space with a lovely pool, great gardens and a house furnished with everything we needed. Mangoes from the garden were delicious. Ilse, the rental manager was always helpful and available when needed. I would definitely recommend this property as a place to stay. I think the honesty of the owners stand them in good stead. Although this is a huge house for two people, we wanted space and privacy as well as peace and views. The house was as described and had lots of land around it although the grove/orchard is more workmanlike than decorative. The wifi worked well although there was no mobile phone reception. There are two friendly dogs which live at the property (outside) and although the guests do not need to interact or look after them, they are very much part of the place. Dealing with Ilse, the manager, before our arrival was straightforward and she made us feel very welcome. When we needed a reading lamp for the sittingroom, she went out and bought one immediately. The location is great, just outside the village, with lovely mountain views. You definitely need a car to get to the supermarket (15 minutes) or the coastal resorts. We were delighted to get back to our house in the hills after the bustling facilities of Maspalomas. Although we were very lucky with the weather (January) as it was our first visit to Gran Canaria we thought this was normal! 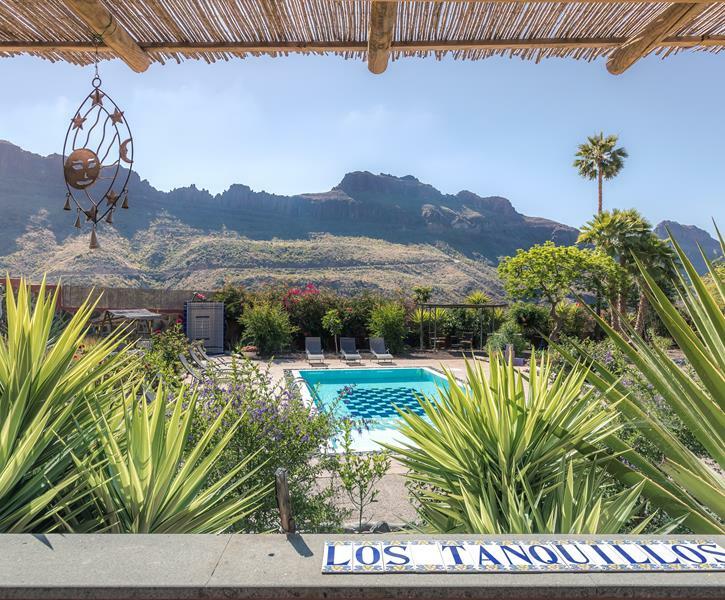 We would definitely consider coming back to Los Tanquillos and would recommend it, particularly to families. 8 henkilöä henkilöä pitivät tätä hyödyllisenä. The property really exceeded our expectations. Perfect place for larger group of people. We were in all 10 adults 6 children and 2 infants and there was plenty of space for us (with some extra matresses on the floor for some of the children to sleep on). Beautiful and well kept garden and pool. Very beautiful and calm surroindings. Modern and well working kitchen (could use some newer pots & pans though). Top class, highly recommended!